This film-inspired doll brings Harry Potter and his friends back to Hogwarts! 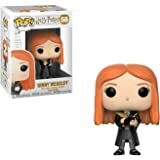 Young fans can recreate their favorite scenes from the movies, or imagine their very own, with Harry Potter dolls. 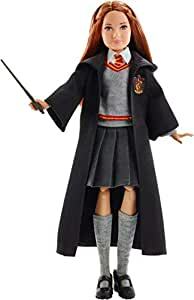 Ginny Weasley doll looks just like her character in the iconic film series and comes dressed in her signature Hogwarts uniform, complete with a Gryffindor robe. With eleven "joints" -- in the neck, shoulders, hips, knees, elbows and wrists -- GINNY doll is ready for action storytelling and spellbinding poses! 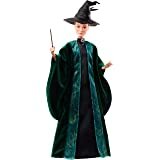 Doll comes with a personalized wand matching the one GINNY uses on screen -- perfect for casting spells and inspiring imaginative play. Colors and decorations may vary. 5.0 out of 5 starsSuper cute and arrived much faster than expected. My 10 year old Harry Potter fan loves her. I grew up with Harry Potter as both the movies and books came out so I was SO excited to add these dolls to my collection of memorabilia. I love posing these characters on my shelves in different ways or scenes and they’re super cute and great quality!! 5.0 out of 5 starsGreat detail. High quality. Great detail. High quality. My daughter loves it. Exactly as pictured. Great shipping time.